One of the best flavors going is that butterscotchy melding of butter and brown sugar. I love butterscotch, I love caramel, I love toffee. And I love what happens when you add fruit to the mix. A tarte tatin is basically apples in butter/brown sugar, baked under a pastry crust. And upside-down cakes are fruit in butter/brown sugar, baked under a blanket of cake. In either case, you flip the thing over and end up with delectable gooey fruit on top of baked perfection. It's rhubarb season; I made a rhubarb upside down cake last weekend. It's an easy cake, and adaptable. The recipe came from epicurious - I fiddled with it, changing the spices, using yogurt in place of buttermilk. [Small buttermilk rant: why does it only come in quarts? I only ever want a half cup at a time, and then all the rest goes bad. Hence, the use of yogurt herein.] And I had the time to make a fussy basketweave pattern with the cut rhubarb, but it would have been fine in a tight single messy layer instead. Ice cream or whipped cream would be nice, but not necessary. And if there are leftovers, it makes a perfect breakfast. Topping: Melt butter in a well-seasoned 9 or 10” cast-iron skillet. Sprinkle brown sugar evenly over bottom of skillet and heat, undisturbed, 3 minutes. Don’t worry if it’s not all melted. Remove skillet from heat. Arrange rhubarb (rounded sides down) in one layer over brown sugar. A basketweave pattern is pretty. Cake: Mix cinnamon/ginger, flour, baking powder, baking soda, and salt together in a bowl. Stir milk into yogurt to thin it out. Beat butter and sugar in a mixer until light and fluffy, then beat in vanilla. Add eggs and beat well. With mixer on low speed add flour mixture alternately in batches with yogurt/milk, beginning and ending with flour mixture and beating until just combined (do not overbeat). Spoon batter over rhubarb in skillet, spreading as well as you can without disturbing the rhubarb, and bake until golden, about 45 minutes, or until a tester comes out clean. Cool cake in skillet on a rack 15 minutes. Run a knife around the edge of the skillet and invert a plate over skillet. Keeping plate and skillet firmly pressed together, invert cake onto plate. Carefully remove skillet and serve warm or at room temperature. It's not enough that I can't visit my mother without nabbing some of her plants. 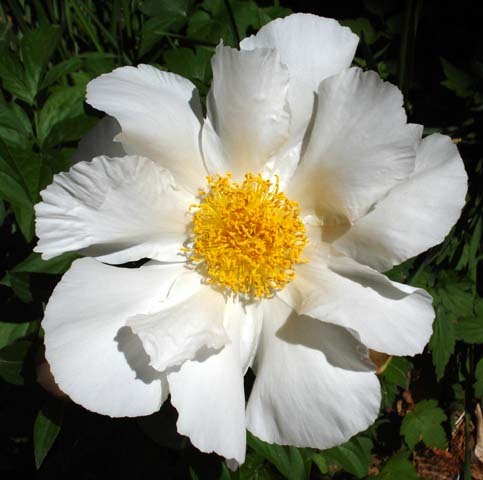 On Sunday, I was on my way up the street from her house to get a piece of a peony in a friend's yard - a wonderful peony that looks like fried eggs, with single white petals surrounding a yellow center - when I spotted an iris blooming across the street in the house sold out from under the elderly neighbor last fall. The house has been vacant since the tag sale, and there's been no sign of any activity save the clear-cutting of every tree on the property. Every single tree. They left one shrub down near the sidewalk. The iris was blooming in the back of the house, but off to the side so it was visible from out front. 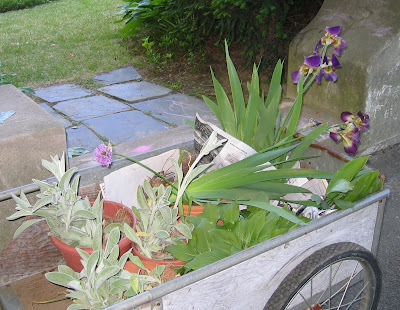 I grabbed the garden cart, along with some plastic pots and newspapers and a shovel, and I hightailed it over to rescue that poor iris. And, because I couldn't help myself, I dug up a clump of hosta, a bunch of lily of the valley, a whole mess of stachys (lamb's ears), and one allium that had escaped from civilization into what little remained of a lawn. It turned out that there were a lot of irises - two different varieties, mostly purple, neither beautiful - they both came home with me. Part of me wants to write a letter to the minister's wife and tell her that I've rescued some of her plants, along with two charming terra cotta pots. But part of me thinks that it'll break her heart. Libby wants to know six things about me. There are rules, but I can't deal with rules. Tag yourself if you want to. For some reason, I was thinking about english muffins the other day. I was thinking that Thomas' English Muffins are really the only ones to buy, to eat, to savor. One thing led to another, and I was making a list in my head of commercial food products that are without equal, things I love to eat, stuff that's just perfect. Mind you, we don't subsist on a lot of prepared food. For the most part, we buy milk and eggs and meat and fruit and vegetables and we cook. But there are some great things that aren't reproducible. Trader Joe's peanut butter filled pretzels - I had some of these in a little bowl on the counter and W. came along and grabbed one, tossed it in his mouth, and spit it out. I was hysterical. He didn't know there was peanut butter inside, and thought he'd got a pretzel with a worm or something inside, not expecting that soft center. Coca-cola - with caffeine and sugar, in a can - nectar of the gods, oft just called "nectar" in these parts. I don't like it in a glass, I don't like it in a bottle, I don't like it from a dispenser. Just straight from the can, ice-cold, thanks. Walker's shortbread - yeah, you can make your own shortbread, but this stuff is just perfect. Crown Pilots - Nabisco keeps trying to put these in the dustbin, and in fact maybe they've done it again because they don't appear on the Nabisco website and they're out of stock at the Vermont Country Store. As it happens, I bought a box a few weeks ago, and they were just as I remembered. Plochman's Mustard - This is the perfect mustard - so perfect that you can practically eat it out of the jar. The inimitable Nutmeg gave me an E for Excellent a couple of weeks back. I'd like to pass it along to Queen Mediocretia, someone I found when I googled blogs looking for someone dealing with a hospice situation. I hit pay dirt with her. She's funny, and she just buried her mother. Which Alltop badge should I choose? And last but not least - does anyone need a paperback copy of Charlotte's Web? Somehow we ended up with two. Leave a comment and I'll make a random pick on Friday. I grew up swimming in salt water. Not only did we go to the ocean every Sunday in the summertime, we belonged to a yacht club with a salt water swimming pool. To this day, I find fresh water weird to swim in. Your buoyancy is better in salt water, and salt water feels nicer in your eyes - after all, your eyes are filled with salt water. Pretty much every day, all summer long, we went to the club. My mother camped out in one of the adirondack chairs, drinking iced tea from the tea lady. And we plopped in and out of the pool, seared our bellies on the hot slates, ate frozen Milky Ways from the snack bar, and hated every minute of "adult swim". One day, I swam to the edge and tipped my head to slick my hair back, but I caught my chin on the concrete lip and ended up in the emergency room with six stitches. Two days later, my little sister, who was little enough to be swimming with a bubble, jumped into the pool backwards and split her chin open. Another trip to the ER, another six stitches. Hers were black; mine were blue. And a couple of days after that, my father did a cannonball into the not deep enough midsection of the pool, and sprained his ankle on the bottom. QED: bad things happen in threes. Yesterday, I was poking through a box of family photos and found an envelope of old postcards of the town I grew up in, including two of the club. The photo of the clubhouse was taken before 1929 - because that building was replaced by a stodgy columned brick edifice. And I don't know when the photo of the pool was taken - but the pool looked nearly the same when I was a kid. In fact, I think some of the pictured chairs and benches were still around, thickly painted with white paint, though the wood framed diving boards had been replaced by a pair of springy modern diving boards (low and high) with metal frames. It was nice growing up with that pool. We lived close enough that eventually we kids could walk down there alone. It became a home away from home, and a reason to never have to go to sleepaway camp. And despite its echt WASP trappings, it was full of eccentrics. The local superintendent of schools hung out at the pool, drinking beer on ice in a skimpy black bathing suit. How could we take him seriously, knowing what he did on his weekends? A boy my brother's age wore the same Speedo that Mark Spitz had worn when he scored the seven gold medals at the 1972 Olympics. That boy wore that suit every single day, and at the end of the summer, his buttocks were tanned with stars and stripes where the sun had snuck through the white in the pattern. Somewhere in there, my parents got divorced - but we still kept using the club. To keep everything copacetic, and to facilitate my father paying the bills for his kids' activities, the club set up a special account for us: Z226. Everyone else had an account number that started with the first letter of their last name; we had Z226. It was kind of dramatic and liberating, though it could have been like a scarlet letter. A couple of times each summer, we'd have dinner on the terrace, standing in silence while they shot off the cannon and took the flags down at sunset. The house salad was always garnished with slivered red cabbage and dressed with a vinaigrette laced with celery seed. Every time I toss a little celery seed in my salad dressing, I remember that salad from the club. I kind of miss it. The club that is. I can make a fine salad anytime. To know that people and institutions are not infallible. to tolerate those who think otherly than she does. To be able to forgive. To be a force for positive change. To take care of her father and me when we grow old. Niobe tipped me off to this ages ago; for some reason I needed to feel painterly this morning. An eagle soared in the sky-blue sky. I was standing on the platform, waiting in the morning sun for my southbound train. In the sky, a red-tailed hawk made lazy circles, looking for prey. After a moment, a smaller bird joined in, riding a current, scurrying to catch up, diving at the bigger bird. And then they were gone. There were a dozen or so people waiting with me, but only one other noticed the birds. Everyone else had their heads in the paper, or their noses to their blackberries, missing the beautiful morning, missing the bird dance above us. I tapped the other watcher on the shoulder. Did you see that? What was going on? I don’t know. I thought perhaps it was a fledgling, learning to fly. Hmm, maybe, because the bigger bird didn’t seem at all upset by the smaller bird. We talked about the birds for a moment, and then the train came. Later, I mentioned it to W. – he said Oh, it’s a sparrow-hawk. Anyway, it’s too early for fledglings. Somehow, this landed me smack dab in the middle of the Audubon Society website, where the whole text of Audubon’s Birds of America is reproduced. Oh, the language! 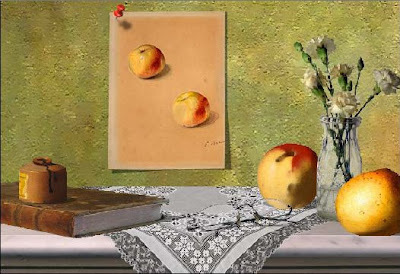 …the little hunter rises in the air, describes a few circles, moves on directly, balances itself steadily by a tremulous motion of its wings, darts towards the earth, but, as if disappointed, cheeks its course, reascends and proceeds. Some unlucky Finch crosses the field beneath it. The Hawk has marked it, and, anxious to secure its prize, sweeps after it; the chase is soon ended, for the poor affrighted and panting bird becomes the prey of the ruthless pursuer, who, unconscious of wrong, carries it off to some elevated branch of a tall tree, plucks it neatly, tears the flesh asunder, and having eaten all that it can pick, allows the skeleton and wings to fall to the ground, where they may apprise the traveller that a murder has been committed. That is how the sparrow-hawk hunts. (The hawk) falls upon and seizes an old fowl, the dying screams of which are heard by the farmer at the plough, who swears vengeance against the robber. He remembers that he has observed the Hawk's nest in the woods, and full of anger at the recollection of the depredations which the plunderer has already committed, and at the anticipation of its many visits during the winter, leaves his work and his horses, strides to his house, and with an axe and a rifle in his hands proceeds towards the tree, where the hopes of the Red-tailed Hawk are snugly nestled among the tall branches. The farmer arrives, eyes the gigantic tree, thinks for a moment of the labour which will be required for felling it, but resolves that he shall not be overreached by a Hawk. He throws aside his hat, rolls up his sleeves, and applies himself to the work. His brawny arms give such an impulse to the axe, that at every stroke large chips are seen to fall off on all sides. The poor mother-bird, well aware of the result, sails sorrowfully over and around. She would fain beg for mercy towards her young. She alights on the edge of the nest, and would urge her offspring to take flight. But the farmer has watched her motions. The axe is left sticking in the core of the tree, his rifle is raised to his shoulder in an instant, and the next moment the whizzing ball has pierced the heart of the Red-tailed Hawk, which falls unheeded to the earth. The farmer renews his work, and now changes sides. A whole hour has been spent in the application of ceaseless blows. He begins to look upwards, to judge which way the giant of the forest will fall, and having ascertained this, he redoubles his blows. The huge oak begins to tremble. Were it permitted to speak, it might ask why it should suffer for the deeds of another; but it is now seen slowly to incline, and soon after with an awful rustling produced by all its broad arms, its branches, twigs and leaves, passing like lightning through the air, the noble tree falls to the earth, and almost causes it to shake. The work of revenge is now accomplished: the farmer seizes the younglings, and carries them home, to be tormented by his children, until death terminates their brief career. Such violence at nature’s intersection with man. Hawk eats man’s chicken, man takes hawk’s young for his own children to torture, and kills tree in process. Whoa. I need to think that today’s farmer wouldn’t destroy the hawk’s nest and young, but would protect his chickens instead. Then again, the hawk’s habitat likely will instead be destroyed for another swath of McMansions. See what happens? 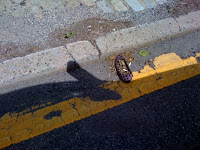 I've wended my way from minding my business on the train platform, and suddenly the world has come to an end. It's a wonder I manage to get up in the morning. When I was poking around on the Times website the other day, looking for the tutti-frutti ice cream recipe that turned out to be fruit ice cream, I found something else called tutti-frutti. And the funny thing? I recognized the "clipping". My mother has that clipping, from the original paper, not an electronic pdf clipping. And it's something she used to make. But we never called it tutti-frutti - we just called it brandied fruits. The gist of it is that you start in June with a bottle of brandy, and a bunch of strawberries (and sugar). As the summer goes on, add fruit in season (and sugar). At summer's end, put it away until Christmas. It turns into an unsightly brown sludge, but it tastes awesome. You then put some in jars and give it away as presents, and eat the rest over vanilla ice cream. I think I'll try some this year. 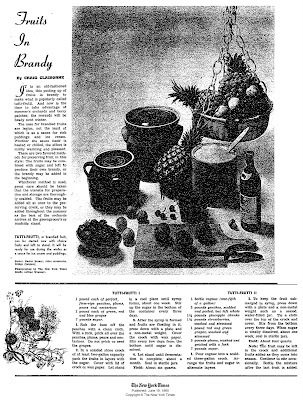 The Times recipe (#2 in the clipping) calls for 1 750 ml bottle of brandy, 10 pounds of fruit, 7 pounds of sugar, and a 3 gallon crock. Start with the brandy, and add fruit and sugar. For each pound of fruit, use 3/4 pound of sugar. Use soft fruits, like berries, grapes, peaches and plums. Don't use bananas or citrus or apples. Pears would probably be good; the printed recipe calls for pineapple. Keep the fruit submerged with a weighted plate. Eat it when it's ready. And if I haven't sated your desire for tutti-frutti yet, someone's making scratch & sniff wallpaper called Tutti Frutti and of course, Little Richard sang it. We got into the car the other day, and the music started up in the middle of a song. From the back seat I heard "That's Holly Lou Year, right, Mommy?" Well. I certainly got exercised when I opened the mail yesterday. We registered the kid for kindergarten last month. Yesterday we got a form in the mail, to verify all of the data on file for her. I was flabbergasted to see that - because her last name is the same as mine and not the same as my husband/her father's - they made the assumption that W. was her stepfather (and not even her legal guardian, to boot). The nerve. So I shot off the following letter (redacted, as needed). Making friends, don't you think? I hope she appreciates the trail that I'm blazing for her. Enclosed please find the student verification form for Miss M., who will be entering kindergarten in the fall. 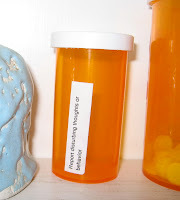 I was startled to find that the form was pre-filled with “stepfather” next to Miss M.'s father’s name. W. is my husband and her biological father (and also her legal guardian). Yes, we are married. Yes, I kept my birth name. Yes, our daughter has my last name as her last name. When we filled out the registration forms, we did not indicate “stepfather” anywhere – W. was listed as Miss M.'s father, period. Someone in your office made an incorrect assumption, and I find it somewhat disconcerting and inconsiderate. I hope that you won’t make such assumptions in the future, whether in connection with our family, or any other families with non-traditional naming rubrics. It will not take much to get villagers back on their feet in these areas because they had so little to begin with. Being wealthy in the delta means having some furniture and a house made of concrete or hardwood instead of bamboo. Farmers till their fields with buffaloes pulling a plow. Now they lack both buffaloes and rice seed. During this reporter’s time in the delta, several times as many buffaloes could be seen floating dead on the water as were grazing on land. The villages often have dedicated ponds and large ceramic jars to store drinking water. Many of those jars have broken and the pond water has been blackened from the hay and foliage rotting in it. I don't know about you, but I think the statement "it won't take much to get villagers back on their feet" smacks of first world arrogance. A house is a house, whether it's made of reeds or bricks. A buffalo is a buffalo, a jar is a jar. Where's that buffalo going to come from? Where's the water bottle going to come from? This is a country that is completely controlled by a military dictatorship, and is hiding the breadth of this natural disaster from the rest of the world. It's going to take a hell of a lot to get those villagers back on their feet. Do you want to take a picture of that for your blog? That was what my husband said to me after he'd finished pulling the meat off the ribs before dinner last night. 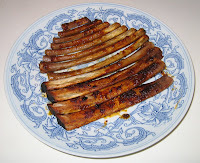 The ribs had cooked until the meat had pretty much fallen off the bone, which is why he went ahead and extracted the bones; why he laid them out like some peculiar musical instrument is beyond me. Pretty though, no? I think it looks a little like a temple, especially on that Asian-y plate. I've not been cooking much at all recently. Not enough time, not enough motivation. But yesterday, when some ribs surfaced in the freezer, I made up a batch of barbecue sauce using a recipe I found on Smitten Kitchen. [It's really from the Barefoot Contessa, but Smitten's where I got it from.] It is an unassuming looking recipe - a jar of this, a jar of that, everything but the onion and garlic comes in a jar. But it is wonderful - tangy, sweet and a little spicy. Try it! The recipe makes more than you need - we've got three one-cup containers of it in the freezer, and I've got a jar to pass along to an office colleague who will appreciate it (and if I'm lucky, his girlfriend will reciprocate with tamales). The good thing about him having pulled all the meat off the bones? We could eat the ribs with a knife and fork. The bad thing? We didn't get to lick our fingers. I'm not big on Mother's Day. Or Father's Day. Or Easter, for that matter. I love Christmas, and I find Halloween and Valentine's Day charming. And there's a certain majesty about Memorial Day, especially if there's a parade. But Mother's Day? It feels both fraught, and insincere. It took too long for us to become parents, and so there were all those years when I wasn't someone's mother. And it seems so much like a Hallmark holiday - a construct foisted on us by card companies and florists and local garden centers. But I know, I do know, that Mother's Day wasn't actually invented by Hallmark. In fact, Julia Ward Howe wrote the Mother's Day Proclamation in 1870 as a pacifist reaction to the Civil War. So really, Mother's Day ought to be about something more than breakfast in bed and last minute gifts - though I did quite like the marigold seedlings in a handpainted pot that came home from daycare. Leave it to the MOMocrats - they're writing about their dreams, dreams for a better tomorrow, and encouraging others as well. My own mother is dying of lung cancer. She's not going to get to watch my child grow up. My step-sister just died of ovarian cancer. She doesn't get to grow old or know grandchildren. 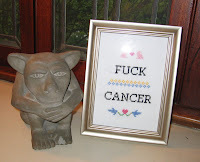 WhyMommy is cancer-free, but still beat from treatment. I hope, I dream, that in my lifetime, we find better ways to eradicate cancer. Chemotherapy and radiation are barbaric therapies - blanket poisoning of the body in hopes of killing the tumor cells. 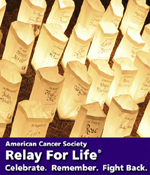 My sister will participate in her third Relay for Life next month - raising money for the American Cancer Society. I will support her effort; won't you join me and help her to meet (or beat) her $1500 goal? She's halfway there - click here or on the button to get to her Relay page. And maybe, just maybe, it'll be better in the future. I hope. It won't stop. It's hypnotic. I can't leave this page. I tell you, it's performance art. Go see here. And let me know what you think! Last weekend, on a beautiful sunny day, we went to visit a nearby private garden that was open as part of the Garden Conservancy's Open Days program. It was glorious. 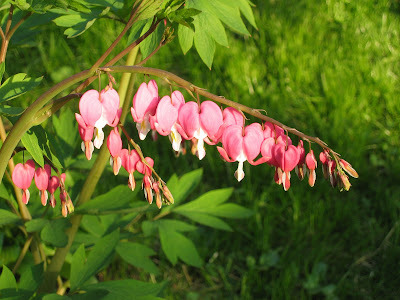 There were lilacs just beginning to bloom and hellebores still hanging on. There were ponds connected by a little stream. There were paths through the shrubbery, and wooden benches deployed in apposite locations. And there were forget-me-nots everywhere, blindingly blue. Yesterday, I was on the train home when I spotted a woman sitting a few rows away, facing me. I thought she looked familiar, but it wasn't until we both stood up to get off at the same stop that I was sure. It was the nonagenarian owner of the property that we'd visited, and she was wearing the same huge and distinctive earrings that she'd worn on Sunday. I asked "Are you Mrs. S___?" and when she said she was, I introduced myself and told her that I'd seen her wonderful garden earlier in the week. We chatted, and as we were crossing the overpass, I asked if she had a ride home. As it turned out, she didn't and I offered her a ride back to her house. I sort of don't know what came over me - usually I don't talk to strangers - but somehow it just seemed like the right thing to do. The thing is, she's made plans so that her garden will become a public garden, owned by the county, with a conservation easement so that it can't be developed. And that's a selfless act, giving that beautiful garden to the public. I figured the least I could do was drive her home. I sent the child upstairs this morning to get dressed, with the instruction "Wear pants. You're going on a field trip." She came back down in a skirt with tights (and an undershirt OVER a long-sleeved shirt, but that's another tale). I said "I told you to wear pants". "But" said she, "tights are like pants with socks attached." The funny thing is, I remember having a similar argument with my brother, back when we were both in elementary school. We were waiting at the bus stop - me in tights, him in pants. And my argument was that tights were warmer than pants because they were continuous, that there was no gap where the cold air could sneak up to your shins. Of course I was wrong, but that's neither here nor there. 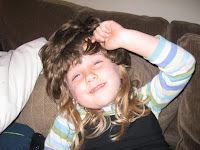 I'm glad to see that my child is honing her debating skills. There is something about using an idiosyncratic data set to generate an illustration that appeals to my sense of whimsy. 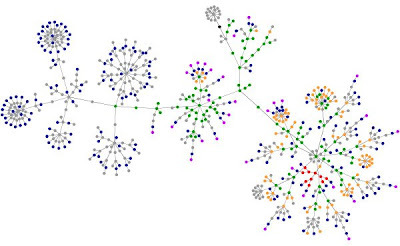 I found this link at the Hotfessional - I think it makes a remarkably pretty picture of my blog, turning it into a constellation. Do you know how much I love my iPod? Not only does it play music, it's a fortune teller too! Here are the tea leaves of my life, as seen through the randomness of my iPod, and as inspired by Nutmeg's Filch It Friday post last week. The rules are simple: Hit shuffle on your iPod, then answer each question by hitting next. I cheated a little - I did use shuffle (I love shuffle! ), but I assigned some of answers to the questions they best fit. Poetic license? Q: What song will you dance to at your wedding (let’s change that to 25th anniversary)?